It's Opening Day of the 2008 Major League Baseball season! This site has been around long enough now for me to simply send you off to a pair of classic (i.e., old) entries that nicely cover both of those topics. 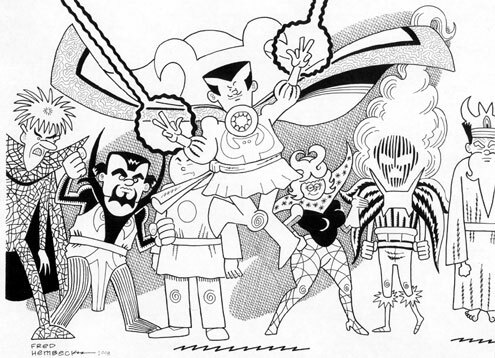 ...and go here to read my personal examination of the infamous Superman story, "The Night of March 31st", aka "The Great Boo Boo contest"! Let's be honest--are you wearying of reading what seems to be a never-ending avalanche of Hembeck interviews? Today you can simply LISTEN to one! That's right--it's me talking, answering questions and running out some familiar (and some not so familiar) anecdotes for the fine folks over at Comic Geek Speak--turn the lights down low, let the cat out, and follow this link and settle in for approximately thirty minutes of, well, listen, and decide for yourself! To read more, go on over to the 104th episode of The Fred Hembeck Show! Secondly, there's the little matter of the current status of THE NEARLY COMPLETE ESSENTIAL HEMBECK OMNIBUS ARCHIVES, about which I've had several inquiries over the last few days. Well, folks the short answer is, it ain't out yet. Believe me, if it were, you'd read about it here! Likely less than an hour after I finally get my hands on a copy I'll post the glorious news on the blog, so trust me--if you haven't read about it here, it ain't out! Ah, now THAT'S a tougher question to answer. I've been told by the folks at Image that they're shooting for an April in-store release date (though I've been informed that the Amazon people aren't quite as optimistic and have it scheduled for late May). When EXACTLY in April they were hoping to let me know by week's end, but week's end has come and gone, and still no definitive word as of yet. Production delays. Turns out that the original plan to publish the book at an 8.5 by 11 size had to be scuttled, with things scaled down to a 7.75 by 10.25 inch size (which is still in the original proportions, significantly wider than the standard comic-book size dimensions you'd find on one of DC's SHOWCASE collections). So that's holding things up a bit. Get up, put on my Hulk tee shirt, drive around to as many of the half dozen various local Stewarts Shops as possible, go in, flash my Gamma-wear, and get myself the free ice cream cone offered to anyone sporting green (with no additional purchase necessary, lads and lassies!). Over the course of the day, I'll hit at least two Stewarts, maybe three--four if I'm REALLY craving the cream--and then I'll come home, put the two Irish music CDs I own into the CD player, hit the repeat button, and let 'em play over and over and over again (which sorta makes up for the fact that they never get aired any other day of the year...). At dinner time, I temporarily abandon my usual vegan/vegetarian diet (as I do on Thanksgiving) and sit down for our annual delicious corn beef and cabbage dinner, accompanied by a bottle of beer lifted from my once yearly six-pack purchase (a second one I'll save a fortnight to enjoy--with peanuts, natch--during the opening day game of the upcoming baseball season), and aye begorrah, THAT'S my day! And no, just in case you're wondering, I DON'T chomp down a bowl of Lucky Charms--hey, let's not push things here, okay? Like most everyone else, I was shocked and saddened to hear of Dave Stevens recent passing. I never had the pleasure of meeting the man, or having any sort of personal interaction with him, but like most everyone else with any interest in comics art, I was a long-time admirer of his exemplary work. He will be missed. Yesterday was a pretty interesting day around here, even if I was mostly relegated to the sidelines. It all started about a week earlier when my good buddy, Ron Marz, sent me an email alerting me to the fact that one of my very favorite current performers, Nellie McKay, was scheduled to play a 7 PM show in Albany's Egg venue on Monday, March 10th! The potential two hour drive didn't put me off the notion, but the fact that I knew Lynn was slated for jury duty that very evening (starting at 5 o'clock) did. The odds of me finding my way up there without her expert guidance were not good, but luckily, daughter Julie jumped in and offered to accompany me, even though she hadn't shown much previous interest in McKay's music. Great, I thought --now it was time to check and see if any of my Capitol Area pals wanted to join us. Turns out everyone was busy, which ultimately was for the best--I just KNEW there was something familiar about that date when Ron first informed me about the concert, even beyond my wife's civic duty. Luckily, before we forked over any money for tickets, Julie was reminded of the Family Planning Advocates Conference taking place that very day (also, wouldn't you know it, in Albany--AND in The Egg! ), a field trip she'd signed up for earlier while doing some volunteer work at the local Planned Parenthood offices. So, she needed one car to get the bus at 7 AM, and wouldn't return until after 8 in the evening, while Lynn needed car number two to get herself to court. Meaning, whoa Nellie--maybe next time. But what really turned out to be interesting was who Julie saw and who Julie didn't see in her day-long jaunt into political activism: Nellie McKay was the conference's featured guest performer and put on an hour show for the gathering during the mid-afternoon (her show in the Egg later that evening being no mere coincidence, apparently), impressing Julie mightily with her performance. And as for who Julie DIDN'T see? For reasons then unclear, New York's Chief Executive had to duck out of giving his scheduled opening remarks, which disappointed many in the crowd--Julie told me that, driving up to Albany, several of the women on the bus were effusive in their praise of the N. Y. Gov for his stands on women's issues. Julie returned about as stoked up as I've ever seen her, full of a cautious idealism for the political process despite practically witnessing a scandal unfold right under her nose! And Lynn? She was chosen to be a member of a jury, so I'll have to wait until the trial's conclusion to get all the details about her adventures--she's expecting it to wrap up in another evening, two tops. As for me, well, I spent the day split between lettering a new strip you'll all see in a few days and transferring three of my Soupy Sales LPs ("Spy With A Pie", "Bag of Soup", and ""Still Soupy After All These Years") from vinyl to CD with this nifty little device Lynn gave me for Christmas (also, the two record set, "2nd Honeymoon by Deaf School"), all the while watching the Eliot Spitzer saga unfold on the tube following a 1-1 spring training Mets/Red Sox contest! Julie Hembeck--bystander to history! What a day! Getting onto the Internet earlier, one of the first places I headed for was Tom Spurgeon's The Comics Reporter page, if for no other reason so as to set up a link for you people to read my responses (as well as those of several other fine folks) to this week's Five For Friday survey (name five things that should be absolutes in the DC universe), only to discover that leading off the page was his week's featured interview and it was with (uh huh) ME! 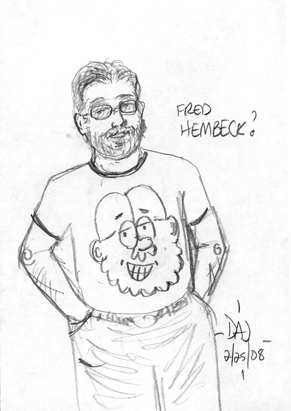 The Comics Reporter interviews Fred Hembeck. Thanks a whole bunch, Tom--I very much enjoyed my Tuesday afternoons with The Spurge, and miss 'em already! See you at the April NYC con--and don't worry, I'll have that elusive GEORGE FOSTER comic with me! For your joyous 55th, I present you with this link! Go friends, and check out my good buddy's blog! The gift of traffic? PRICELESS! By the Hoary Host that is Hembeck, WHO for is that Across The Page? Dr. Strange and the Strangers!! Click the pic for a better look, and go here for this week's magical eBay auction! (Oh, but just so everyone knows--I do NOT actually own a tee-shirt with a big Fred Head emblazoned on front! However, I DO have a shirt with a large reproduction of Mr. Bean's visage hanging in my closet, a gift from a good buddy. I will somewhat shamefacedly admit, though, I'm usually reluctant to actually leave the house and go out in public wearing it! Still, I HAVE found that, in the past, it 's a whole lot of fun to threaten to put it on just before one of Julie's friends--especially the boy types--comes by the house for the first time! "Hello there, young fella--I'm Julie's dad, and this? THIS is one of my true hero's, Mr. Bean!" Y'know, someday I'm actually gonna go through with that little scenario! Either that, or get me a Cartoon Fred shirt!